Public Security Minister Erdan warns that conflict with Hezbollah will be at the expense of Lebanese, Syrian, citizens. 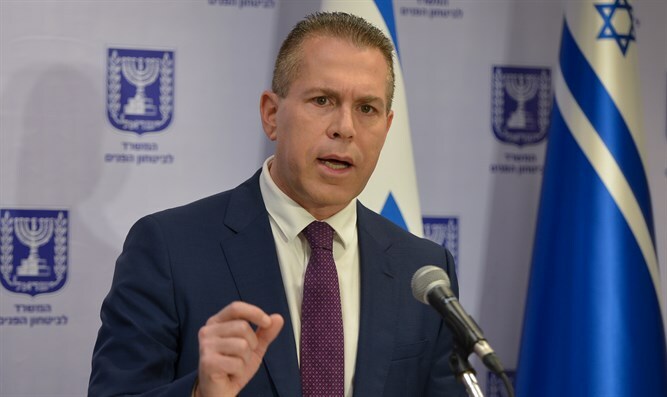 Public Security Minister Gilad Erdan (Likud) warned that if Israel has to fight Hezbollah, "the citizens of Lebanon and Syria will be the ones to pay the price." Speaking in an interview with Army Radio, Erdan discussed the recent exposure of a secret Hezbollah infrastructure as well as the tensions on the Temple Mount. "If there is a conflict with Hezbollah, the citizens of Lebanon and Syria will be the ones to pay the price," he promised, adding that "they are the ones who will need to explain things to the international community." Regarding the Temple Mount, Erdan said, "The Waqf has shown frailty and weakness in its management of the site, and its failure has allowed the masses to do whatever they please." The Waqf is the Jordanian body which administers the Temple Mount. After a Tuesday firebomb attack on the Temple Mount, Israeli security forces conducted a thorough search of the area, discovering several containers containing flammable materials in various areas, as well as firecrackers and Molotov Cocktails. Last month, Arabs violently forced their way through the Temple Mount's Golden Gate, a site which has been closed since it was discovered that those running it had connections with the Hamas terror group.